Cooking over a camp fire. Whether you are a casual RV park camper or a serious wilderness hiker, wood camp stoves should be on your camping essentials checklist. 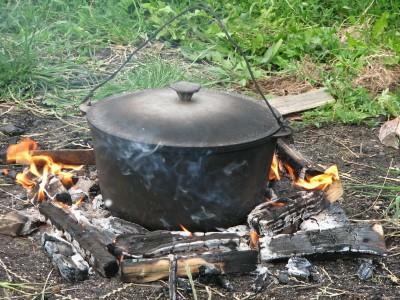 There is nothing worse than camping for several days without warm, comforting food to enjoy. Prevent the cold sandwich blues by investing in a quality wood camp stove. Though you may be thinking of a cast iron pot hanging over a crackling fire as the definition of a camp stove, there are actually several styles that are better suited to cooking full meals. When determining which types of camp stoves to buy, first consider the type of camping you do, then tailor the stove to best meet your needs. Camp stoves that use wood are typically categorized as either lightweight or heavy duty depending on the thickness of the metal used to manufacture it. The lighter weight metal ones are made from a 22 gauge rolled steel and are often used by dog sledders in Alaska since they way approximately 10 to 15 pounds. These stoves all have a chimney pipe to let the smoke escape and are typically formed into a rectangular box. Wood is inserted into the base and the grate is placed on top. The chimney is located on one side of the box and as the wood burns, it heats up or cooks whatever is placed on the grate. Another style in wood camp stoves is the barrel style. These stoves look similar to a barbecue pit style grill and work basically the same way. Also known as cylinder style camp stoves, the barrel stove uses both smoke and heat to cook food. The wood is loaded into the bottom of the stove and lit. The grate is then put in place and the food laid on top. The stove cover is pulled down so heat can build up in the barrel and cook the food. As the name suggests, collapsible stoves can be folded to a smaller, compact size when not in use. This is especially helpful if space in your RV or vehicle is at a premium. Collapsible styles are also good for use in parks where remote walk-in camping is available since you don't want to have to haul a fully assembled stove to your campsite. The WoodGas camp stove is a metal cylinder that uses a dual gas combustion process to quickly heat foods without the need for propane. When wood and twigs are lit and start to smoke, the smoke is captured in the combustion chamber of the stove. As the smoke builds up, it forms a gas that combusts and provides a significant amount of heat in a short period of time. Both online retailers and traditional camping or outdoor stores offer a wide variety of wood camp stoves. Many of the stoves look the same but have varying dimensions, so when deciding which brand to buy compare size and weight to ensure it will fit your needs. Walmart sells both the cylinder barrel style and some of the smaller traditional wood burning camp stoves. Cylinder Stoves makes the barrel or cylinder style wood stoves in a wide array of sizes. Outfitter Warehouse is a general camping retailer that offers several different wood stove products by manufacturers such as Kni-Co Manufacturing, Kwik Camp, Riley, and Sims.